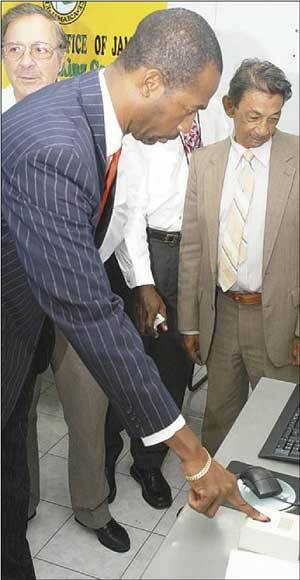 Linton Walters (left), a People's National Party (PNP) representative on the Electoral Advisory Committee (EAC), tests the proposed electronic voter indentification machine recently at the Duke Street offices of the Electoral Office of Jamaica (EoJ), following a press briefing to announce the start of the EoJ's voter re-verification. Looking on are Ryan Peralto (right), and Abe Dabdoub, the Jamaica Labour Party's EAC representatives. The winners for May 02, 2005. Caption: But my name is not Natty Morgan! Caption: "It's been two hours now, how long do I have to keep my finger here?" Caption: Subject's species: can't confirm, further testing gadgets required. Caption: Electronic Elections.... A Better Way of Voting"
Caption: Ryan! Fi di last time. Put yuh finga ya so, like soh. Caption: The Computer..."Beep Beep! The system detects traces of jerk pork"
Caption: mi a push den push den push agen, and de damn caption ting na change atall. Thank you for the 187 responses we received. Enter again and we hope you will be the outright winner next time.